The only daughter of Tonita and Juan Roybal, Margaret Lou Roybal Gutierrez was born in 1934 and was only ten when her mother passed away. When she was 23, she married and moved from San Ildefonso Pueblo to Santa Clara Pueblo. She didn't start making pottery until she was in her late 30's. 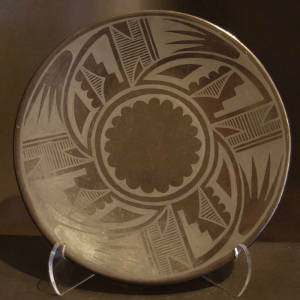 Her father taught her to make pottery and her father and brother influenced her choice in designs to use. Her work has since earned 1st and 2nd Place ribbons at the SWAIA Santa Fe Indian Market.